Brian and Charlene Hernandez have 30 years of experience in fire damage restoration. Their reasons for joining the 911 Restoration Metro East family is because their core ideals are consistent with that of ours. He believes in persistence, transparency, and that the “rubbles of the ruined can be used to build something beautiful.” It is the embodiment of the fresh start that makes him the perfect person to call in the event you experience water, fire, and mold difficulties. “I treat every home like it is one that I want to live in, so homeowners can be rest assured that no corners will be cut when I show up,” he explains. He and his wife split the work at 911 Restoration Metro East. While he is out in the field, Charlene is in the office making sure things are running smoothly. It is a team effort for them, and they want to assure Belleville Residents that they will be able to deliver fast and quality service to their area. To him, it is much more than a business; it is about leading the community by supporting it. So, if you are need of professional and expert care, call 911 Restoration Metro East. The environment at his branch is all about radiating creativity and happiness, which is what makes up the fresh start attitude he brings to every restoration job. He aims to provide quality customer service because homeowners need someone to depend on after an accident happens to their home. Furthermore, problems at a water damage restoration job can become complicated, but this is why Brian is perfect for this line of work. He is the new eyes that will look at old problems, and he will solve any type of concern a homeowner may have. Things can only get better after calling us, so we do everything in our power to ensure that happens. He knows exactly what it takes to get customer’s lives back on track. From restoration to dealing with insurance companies, nobody goes the extra mile as he does. He will always try to bring affordable cost to customers and by doing that he will play hardball with insurance companies. There is where the creativity shines through. He will document the restoration process down to the inch, so insurance companies know which things they need to pay out for. No one else will work that hard for you, so call us. “Fires are freak accidents, and besides some of the basics things to help you react to a fire there is not much you can do to prevent them,” Brian explains. For example, a Belleville customer experienced a fire after her soil combusted from the nitrate content in the ground as a result of a loose cigarette. Luckily, she installed smoke detectors and was able to call emergency services before the fire caused any type of structural damage to her home. However, her home experienced plenty of smoke and ash stains. On top of that, the jet streams from the firefight left some water damage behind. Thankfully, she knew exactly who to call to get her home back to its former glory. Brian and his IICRC certified water damage team arrived within 45-minutes and began the restoration process. 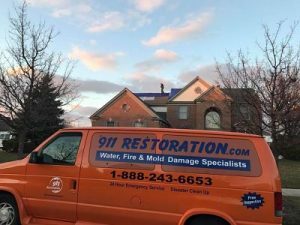 We hold water restoration, fire damage remediation, and odor removal certificates, so it was the type of solution that our Belleville customer needed. 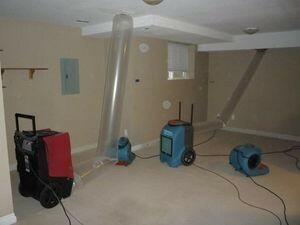 The process began with us pumping water out of the crawlspaces, and afterwards deep cleaning surfaces. It is our fresh start guarantee that when you come back to your home you’ll never know there was any type of water damage or fire damage. Our customer was delighted to return to a home that was better than new! If you are in need of any of our services, call now for a new beginning.